HR Vitamin: Interview Questions That Work! 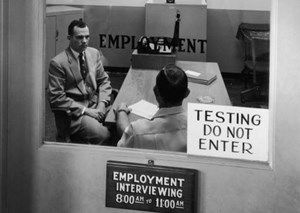 Screening for the right person for the job is always a challenge. You need someone not only qualified, but with a passion for the work and a desire to serve. You don’t have the luxury of multiple interviews, following up with past employers, calling all character references, or reading through multi-page resumes, (they’re usually not true anyway). What follows are 40 quick, easy-to-use, and immediately applied interview questions. These questions will help you to decide quickly whether the candidate you are interviewing is the right fit or not. Each question has been filtered through a vast array of human resources scenarios to determine if any are “questionable” or “offensive” based on current HR laws, regulations, and interviewing rules, (e.g., discriminatory questions based on violations of ADA, Title VI, etc. ), and each one has passed the test. Traditional interview questions, (“Tell me about yourself,” or “What is your greatest weakness?”), are okay, but only reveal a fraction of what you need to make a decision for a qualified candidate. You want to use questions, like the following, designed with laser-like focus to help hone in on specific qualities you are looking for in a candidate. In this section, you want to begin asking generally broad questions that force the interviewee to elaborate, and then some specific questions that reveal greater detail. This approach offers two benefits: It causes the interviewee to think about their responses since they can’t be answered in one or two words, (you get a sense of communication skills! ), and the responses should help you uncover a consistency pattern that reveal truth. 1. What aspects of your work life history did you ever feel passionate about? The interviewee must think over his work history to recall moments of motivation that kept him engaged in his work. The question is good for determining what parts of the job he is most likely to excel in. 2. In your previous work, were there any aspects you didn’t like, but you pushed on through anyway? This question opens the door for the candidate to elaborate on his motivation and drive that keeps him going. The answers should shed some light on the core passion of the candidate if he reveals that although the going was tough, he knew that the reward was greater at the other end. This would be a candidate to continue through the interview process. 3. What two to four things do you need to be successful in this job? The answer to this question should reveal the candidate’s work style and expectations. If they answer that the needs are from you and the company, move on to the next candidate. If the candidate states that most of her needs to be successful come from her, you’ve found a motivated candidate. 4. When it comes to rewards, whether monetary or non-monetary, which ones are the most meaningful to you? Getting to more specific responses now, the candidate must provide an answer that agrees with his work history. Of course, any answer is revealing, but a non-monetary one such as “the pleasure of serving people,” or “the satisfaction I get after a job well done,” are preferable because it shows that the person is working with a passion for the work and not the money. Most candidates with these responses know that the money will come if they follow their passion. 5. During your career, what aspects have not lived up to your expectations? The hope is that as the questioning continues, a voice of candor emerges from the candidate and you get real, meaningful answers rather than vague and general ones. This question, when answered honestly, will allow you to understand any frequent job changes, gaps in employment, or terminations. If the interviewee expected more respect and money along the way, this response may be a red flag. A good response, if it is honest, would be along the lines of “I failed to do…” or “I didn’t perform as I should,” or “I expected too much…” If the response is an emphasis on “I” the candidate is taking ownership of his path and not putting the blame on everyone else. This is a good sign. 6. Why did you apply for this position? The candidate should have no problem answering this one. They may say the reason is money or that they saw the ad and thought they could do the job. Some of the best answers would be that they know a little something about your business and they want to be a part of the team. Or, another good response is that they know that their skill set matches the position and they would like to contribute to the success of the organization. 7. How do you like to be managed? 8. Tell me about what has motivated you recently. 9. Walk me through your mental process of dealing with complaints about customer service. A motivated and passionate candidate will know how to do what it takes to please the customer, particularly if they are a seasoned veteran in the hospitality industry. Look for the candidate taking responsibility for the situation and not pushing the blame on the customer or a coworker.